We spent most of the winter in the desert and heard about the area’s famous date shakes. I began looking for them soon after. Somehow, they eluded me for the first couple of months. 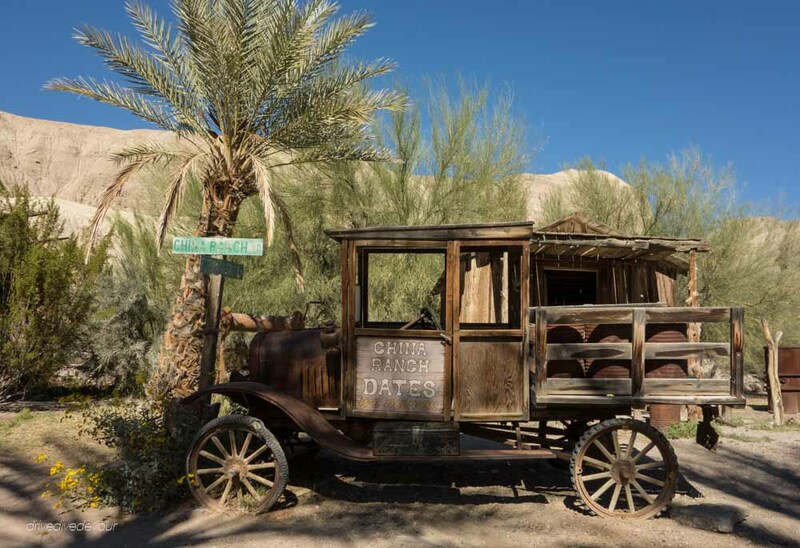 We never had the chance to visit the date farm in Yuma. We missed the place recommended to us on the way to our next stop. And I somehow forgot to turn left out of our camp in Quartzsite and visit the purveyor down the street. But I was still determined and when we made it to Death Valley, I knew it was time. After one of our day trips into the park, we stopped in Furnace Creek for dinner. I did a quick peek online and saw dates shakes listed under the casual cafe. But we when sat down, they were not on the menu. I asked the server anyway who happily said they did make date shakes. Yay! It arrived in a super cold, tall metal container and I took my first sip of a date shake. It tasted like warm vanilla with caramel overtones, essentially delicious. Months after my search began, I was not disappointed. My date shake experience didn’t end there, though. 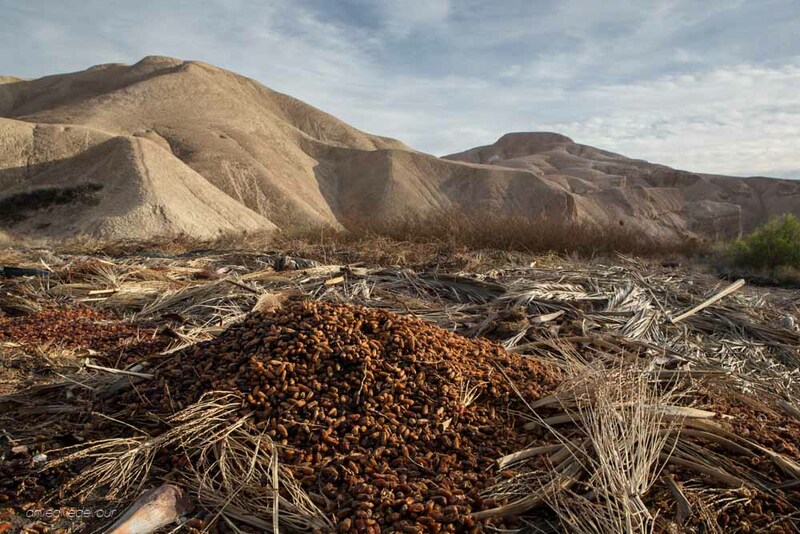 After Death Valley, we headed to a nearby Harvest Host, China Ranch Date Farm. 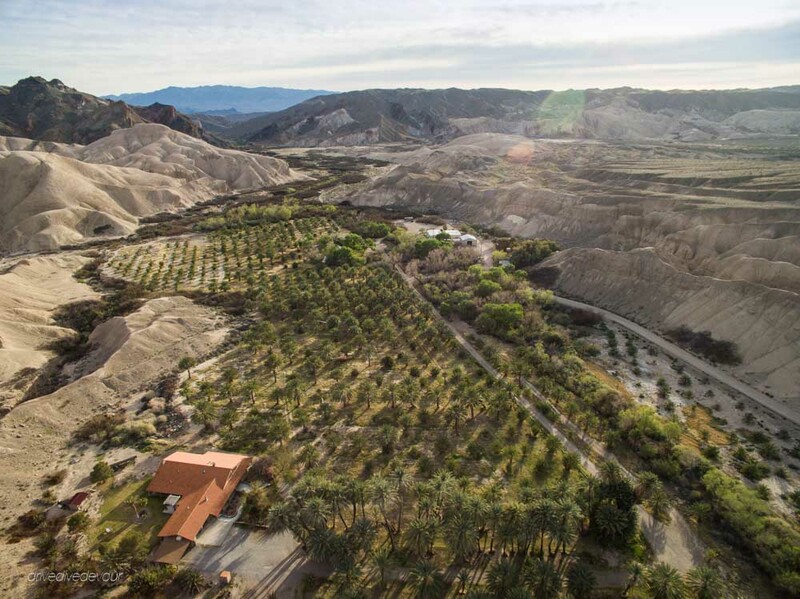 It was a desert oasis with date palms filling up the valley floor. Their store had everything date you ever wanted. 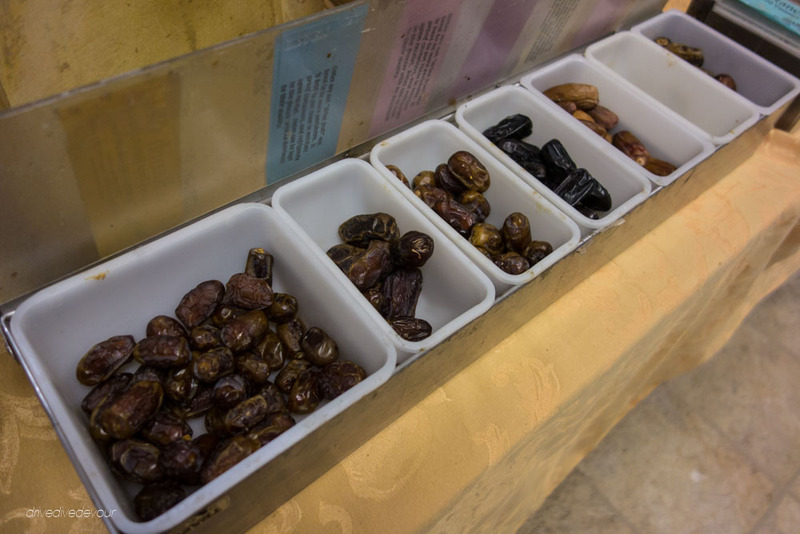 We tasted a variety of dates grown on the premises and sampled date bread and date cookies. Then we stepped up to the counter to order a date shake. The lady asked if we had tried one before and declared theirs superior to the Death Valley concoction. And even though they offered many versions (chocolate, peanut butter, etc. ), we should start with a plain date shake to get the true taste. Their shake consists only of softened vanilla ice cream and dates, but the dates themselves make it special. Instead of using one variety, they take all the fruit considered seconds (not pretty enough to sell whole) and grind it up into a purée. I find this comparable to the end of the season apple cider when you have lots of apple varieties in one press making it all the better. It was truly delicious. I purchased a small container of date purée and I have used it to make the date shakes below. If you wish, you can order this from them directly over the phone, but you can also use whatever dates you can find. The shake lady told to add enough liquid to the purée to make it mashed potato consistency. If you’re using whole dates, remove the pit and roughly chop them before blending them with a little milk and then add the rest of the ingredients. The rest of the ingredients are very simple. For the dairy version, all you need is ice cream and milk. If you have very soft ice cream, you could probably skip the milk like China Ranch does. 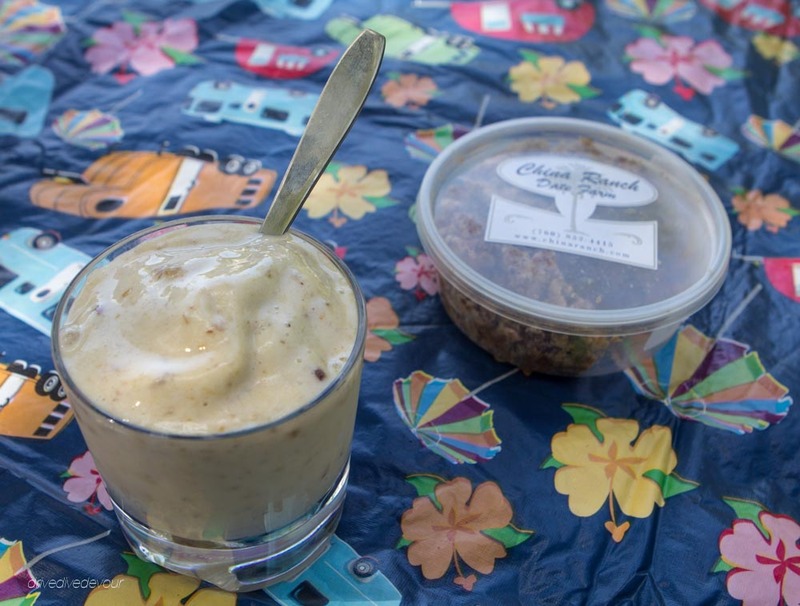 For the non-dairy version, you use a frozen banana instead of ice cream. Have you tried this before? It’s pretty amazing that a frozen banana blends up into the consistency of ice cream. Sometimes I prefer it to the real thing. Another thing to note about the date shake is that it’s a great base for other flavors. You can add just about anything you would to a typical milkshake; chocolate syrup, cookies, etc. One variation I like is adding 1/4 tsp each of cinnamon and nutmeg to create something that tastes like a horchata or rice pudding. Yum! Have you tried a date shake before? What did you think ? 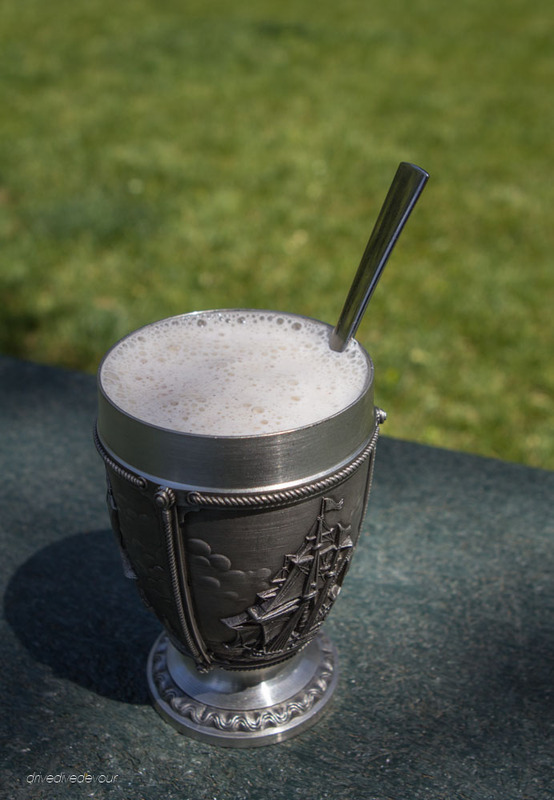 A classic version of a date shake made with ice cream and milk. If using whole dates, first pit and roughly chop them. Add them to a blender with the milk and blend until the dates are finely chopped. Add the ice cream and blend until smooth. If using pureed dates, mix in a little water or milk to the puree to get it to mashed potato consistency. The add the milk, dates, and ice cream to the blender and whirl until smooth. You can make many variations on this shake by adding chocolate syrup, cookies, almond butter, etc. Use ¼ teaspoon each of cinnamon and nutmeg to mimic the flavors of rice pudding. 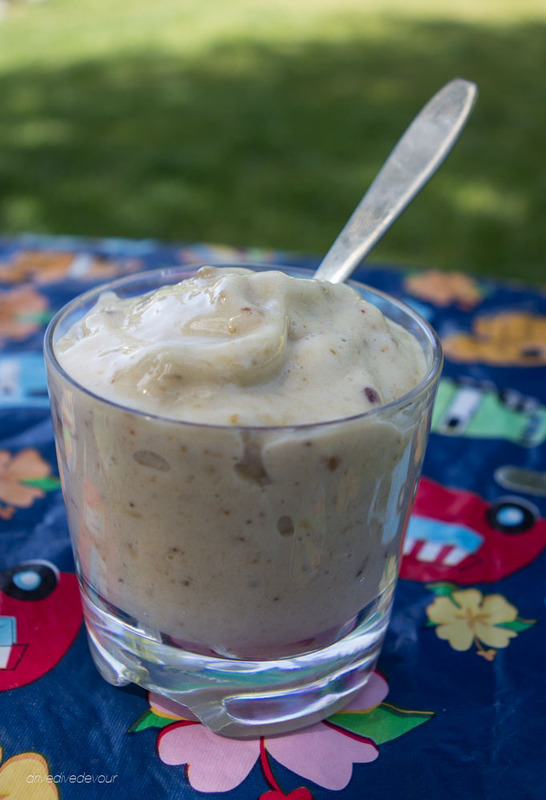 A vegan version of a date shake using bananas. If using whole dates, first pit and roughly chop them. Add them to a blender with the milk and blend until the dates are finely chopped. Add the banana and blend until smooth. If using pureed dates, mix in a little water or milk to the puree to get it to mashed potato consistency. The add the milk, dates, and banana to the blender and whirl until smooth. Thank you so much for including a vegan version of the date shake! Looking forward to trying this! Yum. I would have never thought to make a date shake. Thanks for the recipe, I’ll try it out. 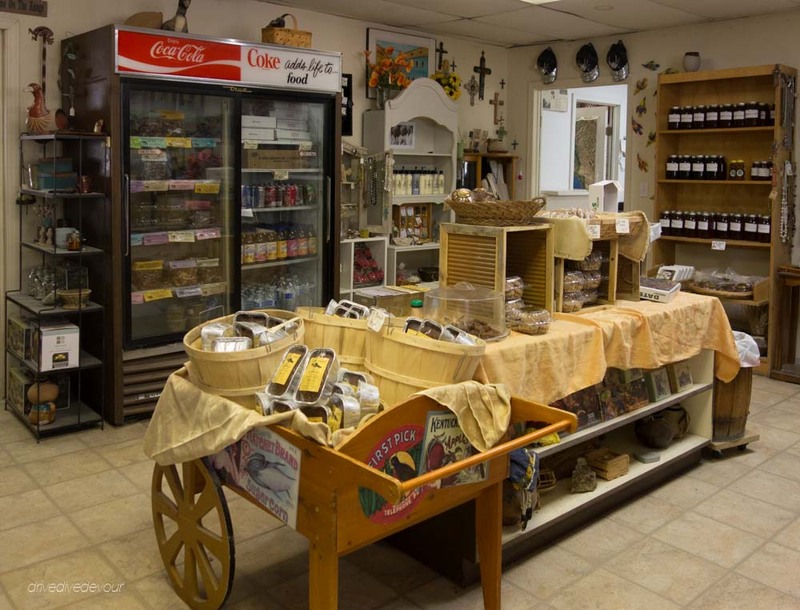 This place looks so neat to check out and cant wait to try a “date shake” Thanks for sharing and I really enjoy following your blogs and learning some neat places to check out when we hit the road. My husband dives so loving learning spots to dive also. Oh, great! I’m so happy to hear that. Hopefully, we’ll meet on the road sometime and go for a dive. 60 miles East on the 8 out of Yuma is a little place called Dateland, they’ve been serving up date shakes for ages and they are really good! Good to know! We missed them when we were there.